Maquat studied with now-Emeritus Professor William Reznikoff. After her Ph.D. she also performed postdoctoral work at the UW–Madison McArdle Laboratory for Cancer Research. Her lab currently studies the many roles RNA — particularly RNA processing and decay — plays in human health and disease. Wittmeyer/University of Rochester Medical Center. Today, her list of accolades is long. Two recent and highly competitive awards include the Vanderbilt Prize in Biomedical Science in 2017 and the Wiley Prize in Biomedical Sciences in 2018. While both honor scientists with a stellar record of research accomplishments, the first also honors those who have made significant contributions to mentoring other women in science. When compared to men, she explains, many fewer women who earn a Ph.D. go on and use that degree in a career, and so it is important to mentor women. One of the best ways to mentor, she believes, is through examples. 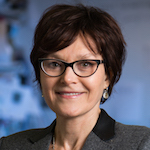 At Rochester, Maquat is the J. Lowell Orbison Endowed Chair in the Department of Biochemistry and Biophysics and the founding director of the university’s Center for RNA Biology, as well as founder and chair of the Graduate Women in Science program. She’s an international leader in the field and is credited with several major discoveries that are informing a new generation of therapies for a wide range of genetic disorders. Top left thumbnail photo by J. Adam Fenster/University of Rochester.